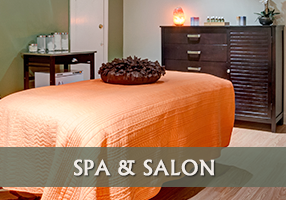 Comfortable and convenient in the heart of downtown Camden, The Inn at Camden Place offers eleven attractively-appointed bed and breakfast style rooms at value-conscious rates. 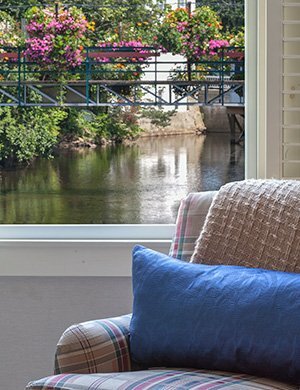 Tucked away from main street noise and traffic, the Inn combines a casual and relaxing atmosphere with small-town hospitality and superb access to Camden Harbor and Penobscot Bay. A two minute walk brings you to our picturesque downtown with its unique shops, galleries and restaurants situated along the waterfront of Maine's most beautiful harbor. 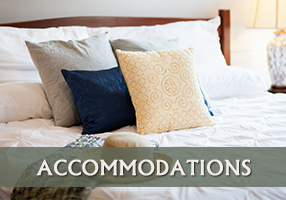 Each of the Inn's spacious rooms (many with sitting areas) are tastefully furnished, have private baths, HD cable tv, air-conditioning and complimentary wireless internet. Coffee and teas are available in the large common area at any time. Parking is conveniently located directly in front of the Inn and is free for our guests. The Inn is located in the historic Brewster Factory building. Having once used hydraulic power, the building is located directly over the Megunticook River. Contemporary renovations maintained the original character and charm while providing the amenities for the present day. 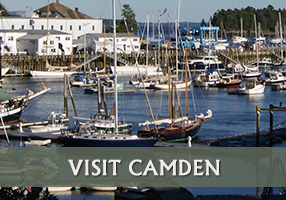 Contact us now and discover The Inn at Camden Place, the "best-kept secret" in Camden!